Amazon has Starburst Original 54oz Party Size Bag on sale for $6.57. If you use Subscribe and Save, your item will ship for free with no minimum purchase, plus you get an additional 5% off. If you have 5 subscribe and save items at once, you will save 15% off. You will pay as low as $5.58. 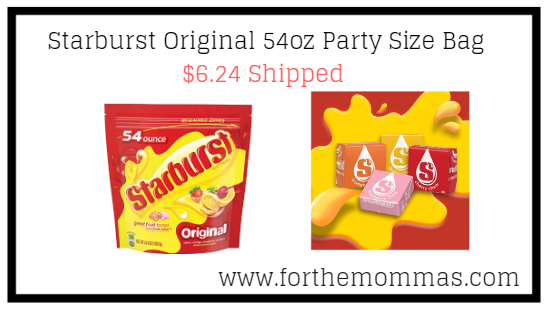 :: Add Starburst Original 54oz Party Size Bag to your cart via subscribe and save. ** If you have never used subscribe and save, you will be subscribing to order the product on a prescheduled basis. You can read more here. No worries, you can cancel your subscribe and save any time after your item ships. Choose 6 month intervals to allow yourself time to cancel your shipment. Note: Amazon prices may change quickly, please check to see if this is still available before you purchase.